Early June will mark the arrival of Cooler Master's Hyper 412 Slim, a new LGA2011 CPU cooler that will be sold for around 39.95EUR. This new HSF offers four direct-touch 6mm diameter heatpipes, an aluminium fin array and two 120mm long life sleeve bearing PWM fans with an airflow of 17.4 - 58.4CFM and a noise level of 8 - 30dBA. 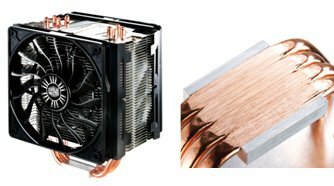 The cooler measures 128mm x 70mm x 160mm (without fan) and weighs 538g. Mounting brackets are included for Intel® LGA2011/1366/1156/1155/775 and AMD FM1/AM3+/AM3/AM2+/AM2.